Pleistocene hominid diversity in Indonesia is a matter of vibrant discussions since over a century. Using advanced methods of virtual imaging, we re-investigated some of the robust dentognathic remains from Java, including the specimen Sangiran 6a originally proposed as holotype of Meganthropus palaeojavanicus but commonly attributed to Homo erectus. Our analyses revealed a higher level of diversity than previously recognised and confirm the taxonomic validity of Meganthropus, an ape that coexisted with H. erectus, Pongo and, maybe, Gigantopithecus during the Early to Middle Pleistocene. In the early 1890s, the Dutch physician and naturalist Eugène Dubois discovered an Early Pleistocene hominid assemblage on the banks of the Solo River, near Trinil, East Java (Indonesia). Together with a skull cap and a femur, two molars were at the time described as paratype of Pithecanthropus (Homo) erectus. The taxonomic identity of the teeth was questioned as possibly belonging to a fossil orangutan (Pongo), but since they have been commonly integrated as part of the H. erectus hypodigm. In the 1930s and 1940s, the German paleontologist G.H.R. von Koenigswald collected a number of Early-Middle Pleistocene hominid specimens in the Sangiran Dome, central Java, including a massive mandibular fragment labelled Sangiran 6a, which he later attributed to a new taxon: Meganthropus palaeojavanicus. In fact, because of a marked morphological and metric variation characterising the Indonesian fossil assemblage, some robust specimens had been alternatively allocated to other nonhuman taxa (e.g., Pithecanthropus dubius and Pongo sp.). However, following the increasing discoveries of fossil hominins in Southern and Eastern Africa, the variation displayed by the Indonesian assemblage other than the remains unequivocally representing fossil Pongo was interpreted as compatible with the range of a single taxon: Homo erectus. That is in this context that I started in 2009 my PhD research in dental paleoanthropology at the Muséum national d’Histoire naturelle (MNHN) of Paris, under the supervision of R. Macchiarelli. Seventeen fossil teeth from Java were temporarily exported to France thanks to the support of F. Sémah and D. Grimaud-Hervé (MNHN) and of H. Widianto (Yogyakarta). They were scanned by X-ray microtomography at the Centre de Microtomographie of the University of Poitiers. My PhD work thus represented the first opportunity to investigate the structural signature of this controversial assemblage of dentognathic remains from Sangiran, until then only considered for their outer features. Most of the specimens revealed the outer and inner typical Homo condition, but a mandibular fragment bearing the second and third molars, Arjuna 9, exhibited remarkably large dimensions and peculiar internal features. This fossil, attributed to H. erectus, also displayed some similarities with other robust specimens, notably Sangiran 5 and Sangiran 6a. A crucial question thus raised: was Meganthropus a valid taxon distinct from Homo? Virtual rendering of Sangiran 6a, holotype of Meganthropus palaeojavanicus. During the three years of my PhD, we had firstly to build a comprehensive comparative database to assess if the internal tooth signature of Arjuna 9 was more human- or pongo-like. But, despite our organisational effort, the number of specimens available at that time for microtomographic analysis was still limited and, by the end of my PhD, we only had access to the scans of less than fifty Pleistocene human teeth from Europe and Africa and to a handful of fossil and recent Pongo teeth. However, this record already indicated us that Arjuna 9 did not belong to Homo, but more likely represented a fossil ape. This was the beginning of an exciting scientific adventure that lasted for over eight years and involved researchers from nearly all continents. Comparisons with the holotype of Meganthropus, Sangiran 6a, were still necessary. Thanks to the collaboration assured since the beginning of my PhD work by colleagues at the Senckenberg Research Institute, notably O. Kullmer and F. Schrenk, we extended the high resolution imaging analyses to other hominid teeth from Sangiran. However, because of high mineralisation, some specimens revealed only poor or even no contrast between the dental tissues, including when using synchrotron radiation. Coincidentally, a new analytical method based on neutron radiation had been just developed at the Antares Facility of the Technical University of Munich by a team led by B. Schillinger. Once agreed with him the best investigative strategy during a meeting in 2012 at the International Centre of Theoretical Physics of Trieste were I performed my first year postdoctoral research, we successfully applied neutron microtomography to three molars from Sangiran. We then scanned the most intriguing specimens, Sangiran 5 and Sangiran 6a, as well as a number of isolated molars of uncertain taxonomic identity. Thanks to the contribution of a number of colleagues, slowly but constantly the comparative database increased in amount and quality, now including larger samples of African and Asian fossil and extant hominid specimens, and also South African australopiths. The more in detail we investigated the robust specimens of the Javanese assemblage, the more it became evident that, yes, Meganthropus was a valid taxon and that it was not a hominin, but rather a great ape. But some of Meganthropus diagnostic features did not align it with Pongo and the questions of its phylogenetic relationships and more likely ancestor were still pending. Among the potential candidates, we had to go back in time to the Miocene, as no Pliocene hominid taxa are known in Southeast Asia and no Pleistocene taxon, including Gigantopithecus, was compatible with Meganthropus. 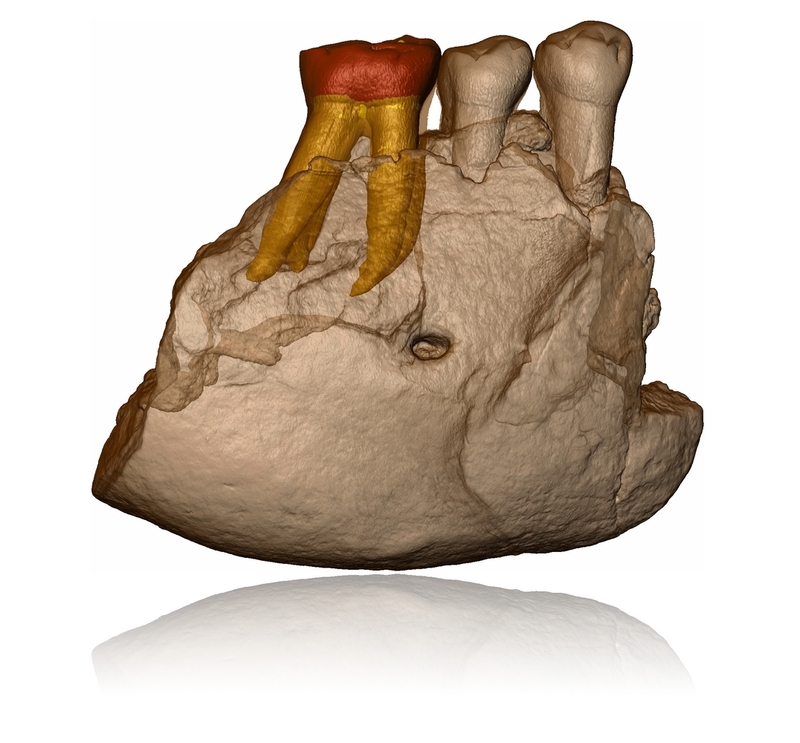 The genera Sivapithecus, Khoratpithecus and Lufengpithecus had to be examined, but no data on their internal tooth structure was available for direct three-dimensional comparisons with our record. We thus furtherly expanded our collaborative network and, thanks to the invaluable scientific contribution of J. Kelley, from the Arizona State University, and of some Chinese and Vietnamese colleagues, we had the opportunity to preliminarily assess the degree of affinity/difference of Meganthropus with those three fossil apes. The five Lufengpithecus molars included in our analyses showed remarkable similarities with the robust Indonesian specimens. In fact, Lufengpithecus exhibits a number of hominin-like tooth morphological features, including a developmental enamel pattern with a periodicity of long-period lines of seven days, thus fitting the six- to eight days average human condition, while Pongo and Sivapithecus have longer periodicities (8 to 12 days). Interestingly, the two hominid molars from Trinil which had been detailed in 2009 by synchrotron microtomography by another research team also show a periodicity of six to seven days, a pattern that can be interpreted either as compatible with Homo or Lufengpithecus. As expected, at different occasions we had to face criticism regarding our results and interpretations on the validity and distinction of Meganthropus as a non-Homo hominid. But this made this research experience even more exciting and challenging. After all, it is not easy to change paradigms. However, besides the case of the Javanese fossils, the expanding Plio-Pleistocene hominid record in Africa, Eurasia and Indonesia is revealing a greater taxonomic complexity than previously assumed, including within our own genus, an evidence which obliges us to constantly revise previous conclusions. Whether by finding new fossil remains in the field, or by carefully re-analysing those already stored in the collections, our understanding of primate evolution continues to evolve. CNRS researcher at the PACEA Laboratory of the University of Bordeaux, in France. Expert of the evolution of the dental structural organization in hominids (from the Miocene to the present), my research projects aim to investigate the hominid paleobiodiversity, evolutionary trends and phylogenetic relationships, as well as to extract some disregarded paleobiological aspects from the teeth of our extinct relatives.